Summer is here and we are basically living outdoors! Cairo wakes up in the morning and immediately asks to go outside and I am always game. Anyone else agree that parenting is just easier in the summer months? We finally got some seating outside from Wayfair Canada and this Real Flame Baltic Loveseat is perfect for our small backyard. It fits two comfortably and is also super lightweight (because of its aluminum frame) so we can move it from our patio area up onto the grass easily. Basically it just feels like we have the comfiness of an indoor couch but outdoors - perfect for summer. I've been sitting outside after the kids are in bed and have just been in heaven with these sweet summer nights. 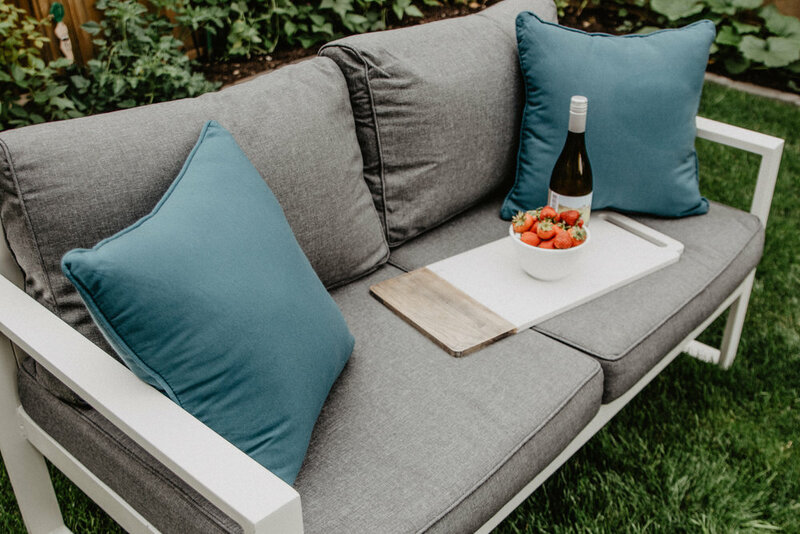 It feels like we have an extra little room outside because our landlords just renovated both patios so it was great to put in this new loveseat and enjoy some warm nights outside with some fruit and wine. We added these Indoor/Outdoor Throw Pillows from Wayfair Canada to complete the loveseat and I love the colour it adds to the white/grey couch. I'm on the hunt for a nice throw that I can use when the nights are a bit chillier and some side tables to complete our patio!